Lady Wave sophomore center fielder Nyesha Wright with a homerun swing. 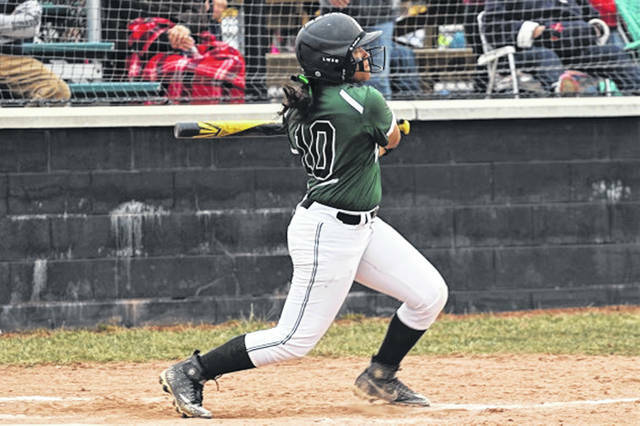 GREENVILLE – The last two undefeated teams standing in GWOC American North league play faced off Monday night when the 7-0 Lady Wave traveled to Tipp City to take on the 6-0 Tippecanoe Lady Red Devils in a conference showdown with Greenville coming away with a 9-8 victory. The Lady Wave grabbed a 1-0 lead in the top of the first inning with Morgan Gilbert leading off with a single to left and racing home on a RBI double to center off the bat of Susi Blocher only to have The Lady Devils plate two runs in the bottom of the inning to lead 2-1 over GHS. Greenville took the lead back in the top of the second with Haleigh Mayo-Behnken legging out a leadoff infield single and moving to second on a Chloe Sowry sacrifice bunt. A two run homer off the bat of Nyesha Wright had the Lady Wave back on top with a 3-2 lead. Tipp knotted the score in the bottom of the second plating a run while keeping Greenville off the board in the top of the fourth bringing the Lady Devils to the plate in the bottom of the inning to score four runs and take what looked like a comfortable 7-3 lead. Not to be outdone, the Lady Wave battled back to plate four runs, all coming with one out in the top of the fourth to knot the score at 7-7. Sowry got things underway in the four run fourth with a double followed with an intentional walk to Wright, a RBI single to right off the bat of pinch hitter Baylee Petry, a two run Gilbert double to left and a RBI double to center by Susi Blocher to score Gilbert with the tying run. The Lady Devils would not score in the fourth or fifth innings while Greenville was going down in order in their half of the fifth. A Bryson Single and a Gilbert double set up a two out two run single to left off the bat of Kennedy Fashner giving the Greenville girls a 9-7 lead. Tipp added a run in the bottom of the inning sending the teams to the seventh and final inning with the Lady Wave clinging to a one run 9-8 advantage. Neither team would dent the plate in the seventh giving the Lady Wave the win in an evenly matched game. The Lady Wave banged out 12 hits on the day, Tippecanoe 11 hits with each team would commiting a single error. Morgan Gilbert went 3-4 with 2-RBIs and 3-runs scored and Nyesha Wright was 1-2 with a home run, two walks, 2-RBIs and 2-runs. Courtney Bryson was 2-3 with 2-runs, Susi Blocher went 2-4 with 2-RBIs, Baylee Petry went 1-1 and a RBI, Kennedy Fashner was 1-4 with 2-RBIs, Haleigh May-Behnken 1-4 with a run scored, Chloe Sowry 1-3 and Layne Claudy scored a run for the Lady Wave. Grace Shaffer was the pitcher of record for the Lady Wave picking up the win throwing 4.1 innings while allowing three hits, one walk, one run and striking out three. With the win, Greenville moves to 8-0 in GWOC play and stands at 12-1 on the season while Tipp drops to 6-1 in conference play and 11-3 on the year. https://www.dailyadvocate.com/wp-content/uploads/sites/34/2019/04/web1_Nyesha-Wright.jpgLady Wave sophomore center fielder Nyesha Wright with a homerun swing.